LG Electronics USA Business Solutions is taking its show on the road. This week, the 2018 “LG TechTour” comes to the Windy City where business-to-business customers will experience first-hand LG’s broad portfolio of digital signage displays, renewable energy systems, enterprise mobile solutions and more. The coast-to-coast LG TechTour, designed to educate partners, resellers, installers and end-users about B2B technologies and trends, kicked off last week in Los Angeles and continues on to New York after this week’s stop in Chicago. This Thursday, LG is taking over the American Airlines Conference Center adjacent to Wrigley Field. In addition to experiencing LG B2B innovations, customers will have private tours of the historic ballpark, home of the Chicago Cubs. The LG TechTour features the industry’s broadest portfolio of commercial displays, led by the unique LG OLED and Ultra Stretch digital signage monitors. Also on display will be advanced LG video walls, impactful direct-view LED screens and groundbreaking transparent color LED film displays, as well as desktop monitors and other innovative B2B IT solutions including the new all-in-one 38-inch UltraWide thin client. New on the LG TechTour this year are LG’s high-efficiency solar panels, led by the flagship 60- and 72-cell LG NeON2 models. Backed with a 25-year product and performance warranty, LG’s award-winning solar modules are designed to deliver higher efficiency and energy generation. In 2018, LG is the number one producer of solar modules for the U.S. commercial market, according to GTM Research. Enterprise mobile solutions highlighted in the LG TechTour bring LG smartphone advances to B2B customers. Unlocked commercial versions of the popular LG V30+, LG V35 ThinQ and the brand new LG G7 ThinQ come equipped with the same incredible features as LG’s consumer phones while offering business customers greater flexibility, performance and cost savings. Featured technology and service partners at the LG TechTours (which vary by location) include Agosto Skikit, Blackbox, BrightSign, Datapath, Hoylu, Hughes, Intuiface, Milestone/Chief, Omnivex, Peerless, PingHD, TSItouch, 22Miles and Userful. 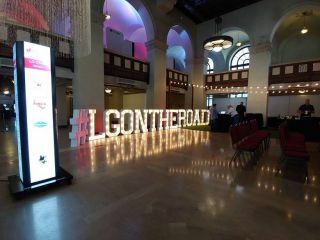 Systems integrators, custom installers and other business partners may register at https://www.lg.com/us/business/commercial-display/resources/our-events/roadshows/TechTour-CHICAGO-2018.